Optional flush mounted screens add a layer of additional protection to an open fireplace. This vent free unit is made with CSA certified design, adding a sense of security in the performance, operation, and safety outcomes during use. 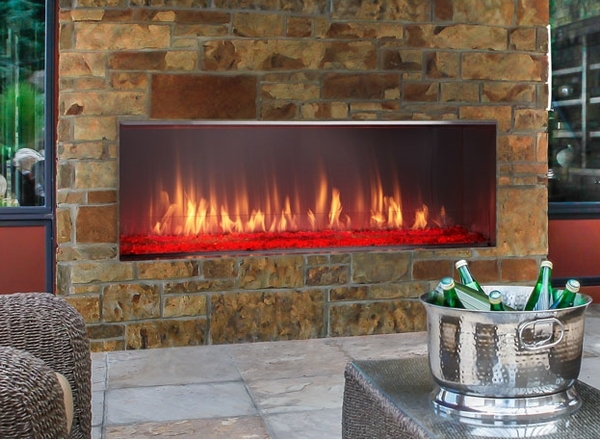 With a BTU rating of 55,000, the sleek model is made with reliable materials, modern stainless steel interior, and is provided with the standard glass wind guard to prevent flame outages and buffeting. More details, including wall controls and LED Backlight, will make this linear gas fireplace a pleasure to own. This fireplace itself weighs 251 lbs., but it does not include the enclosure/stone facade you see in the photo, so we cannot provide a weight for whatever enclosure you may build for it. The item is the fireplace itself only, a full stainless steel linear outdoor gas fireplace, but it needs to be built into an enclosure.